Horses with larger muzzles or jaws usually take a 5 1/2-6 inch mouthpiece. How Does the Bit Fit In the Horse's Mouth? One wrinkle at corners of horse's mouth if bit is fitting properly. A bit should fit your horse's mouth so that the mouthpiece extends approximately 1/4" (0.6 cm) beyond the horse's lips on either side. If the bit is too big it will stick out at the corners of the horses mouth more than that 1/4 " and slide back and forth when the reins are used. If it is too small you will see that the medal is inside the horse's mouth and the moveable area of the cheek pieces that it is attached to will pinch. However, if you are fitting a jointed bit, like a D-ring or loose ring snaffle, there may be no wrinkle on the lips at all. Make sure your headstall is adjusted properly! It should not be too high or too low will make your horse really uncomfortable. 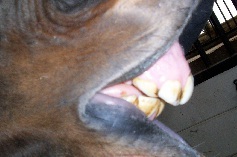 Pinching the corners of the mouth or hitting against the horse's teeth causes pain. Lift the horse's lips and look inside his mouth to make sure the bit is sitting correctly on the bars. Make sure the bit is balanced on both sides of the mouth. When using the reins the bit should not pull through the horse's mouth. Horse travels behind the bit. They travel with an unnatural arch to the neck with their chin touching their chest. It may look like bending at the pole but it can also be the horse's attempt to evade the bit! You often see this with gaited horses who are ridden with long shanks, curb chains, broken snaffles, curb bits and ports. The horse is trying to evade the bit and get away from the pain of a harsh bit. Hash hands by the rider make the pain even worse! Gaited horse people have a saying which is "only a harsh bit in harsh hands!" Unfortunately, too many people are heavy handed. Tom thumb, loose ring snaffles, wonder bits and gag action bits can also cause rubbed skin around the mouth or in the corners of the mouth. 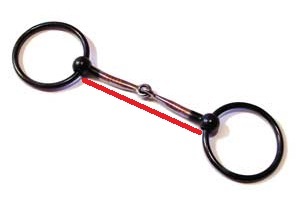 We have gaited horses and use protective rubber rings at the corners of the bit to prevent any rubbing when using a bit. Remember that if you are using a curb chain two fingers (index and middle finger) should fit under that chain or it is too tight. Presently we ride with bitless bridles. Measure where the red line indicates. Remember to add 1/4" to each side. Write down the measurement. The way I measure for a bit is to use a sewing tape measure made of flexible cloth. I put the tape measure in the horse's mouth measuring from corner to corned, pulling the measure taught. I then make a notation of that distance and add 1/4" to each side or 1/2" in all. Then I inspect the horse's mouth to see how the horse's mouth is conformed. Some areas to notice are: 1) sores in mouth, on lips, tongue, etc., 2) inflammation around teeth or any place else in mouth, 3) broken teeth, foul breath, etc. can flag tooth and gum problems, 4) some horses have a fleshy tongue or a low palate, 5) parrot-mouthed horses have an overbite; other horses have an underslung or undershot jaw (under bite) often referred to as a monkey jaw or sow mouth. These are factors that must be taken into consideration when choosing a bit, as well. Abnormalities can also have an effect on selecting and fitting a bit. After I have done all of the above, then I take some of my bits (we have many on hand over the years) that fall within the noted specifications and try them. I observe how the horse responds. Usually their body language and way of going will tell you if the bit is satisfactory or not. Take your time and be patient. A properly fitting bit can make all the difference on how you and your horse get on! Remember, each horse is different in attitude, physical design, training, "baggage" they bring from previous experiences, etc. Have patience!